PowerDesk Pro is packed with features that make document management super easy. With tools to search, edit, track, delete, copy, move, sort, zip, label, view and convert files, life becomes a little more organized. 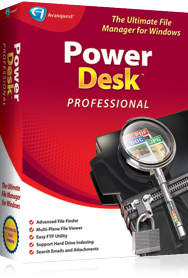 PowerDesk Pro makes managing files, photos and music a snap with far more features and functionality than the standard Windows file manager. Never open the wrong files again! File Viewer ensures you open the right file the first time with a large file preview pane. File Viewer makes browsing photos, music and files easy, you can even view files by artist name, album titles or personal notes! Copy/cut and paste files easily with drag and drop functionality between folders and drives. Single click icons save complete layouts or add layout icons to your desktop, so PowerDesk starts up exactly where you want it to! Add personal notes to any file with a right click. Your notes are displayed in the details or when hovering your mouse over the file. Use this feature to remind yourself what�s in your saved file without opening them. Color code your digital file folders with eight distinct colors. Now it's easier than ever to see in-depth details about your files without having to open them. Music files will show song titles and run times, image files will show size and resolution, Word documents will show document titles and more. Organizing your MP3 playlist is easy with PowerDesk. The MP3 collection management feature allows you to preview, search for, rename, edit and randomize your playlist files in batches, groups or individually.